Extended from Leman Street to Wapping. Daimler Fleetlines introduced - these were sent from East Grinstead where they were used on Route 424. East Grinstead (EG) was of course still under London Transport ownership. DMS231 seen at Wapping ? Extended from Stamford Hill to Wood Green. 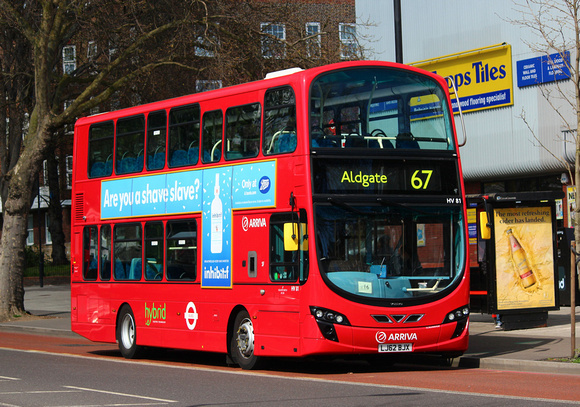 Withdrawn between Aldgate East and Wapping - Sunday Tottenham (AR) allocation introduced. M1379 St Anns Road ? Daimler DMS replaced by Metrobus. Wood Green terminal changed to WN garage. Sunday only AR allocation transferred to SF. 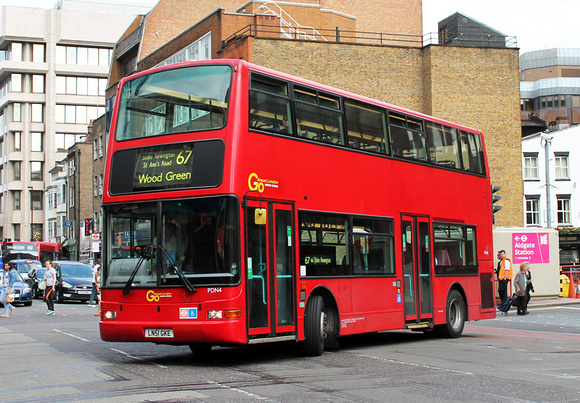 Wood Green terminal revised to Redvers Road. 206 seen in Commercial Street ? The current arrangement is as follows. All drivers sign on and off at SF garage. There are 6 buses from the allocation of 16 parked in AR Mon Sat. sun all SF buses. All changeovers are at SF throughout the day.